PLATE 1. Dogwood blossoms, Taney County, Missouri (March 31, 2009). I found myself in a primordial forest of gigantic white oak trees on an Ozark mountaintop ridge line – and I knew that I was looking at the very hands of the Earth – reaching up slender, loving, green fingers – to touch the face of God. 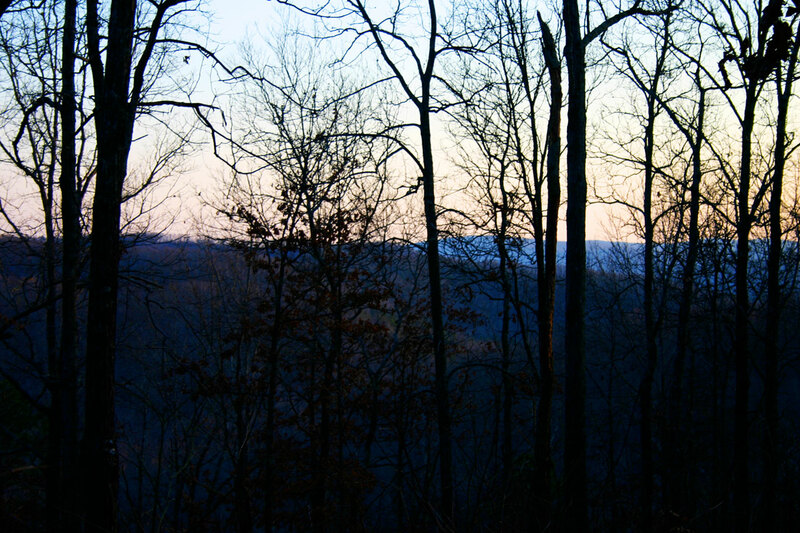 In the dead of winter I looked upon the fantastic black lace along the top of an Ozark Mountain ridge – created by a leafless forest – sketched sharply against the brilliant electric blue of the late Winter’s evening sky. Yes, there surely is a God. PLATE 2. 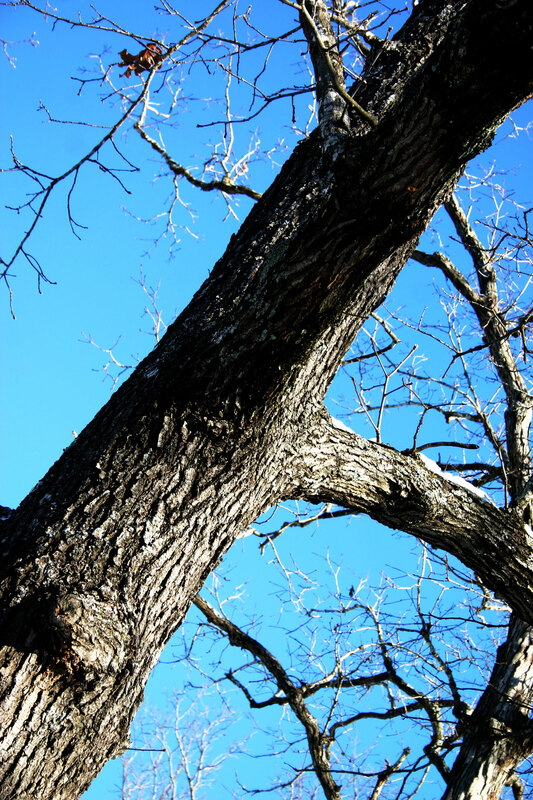 A brilliant blue sky and white oak near Mincy, Missouri (February 10, 2010). I sat for a long while, staring at this particular tree, this stunted, twisted, gnarled old cedar bush of a thing. What has fed it as it has clung to these barren rocks for countless years, battered by nearly two centuries of storms and blistering suns? What does it do to quench its summer thirst? This fantastically tough old creation. PLATE 3. 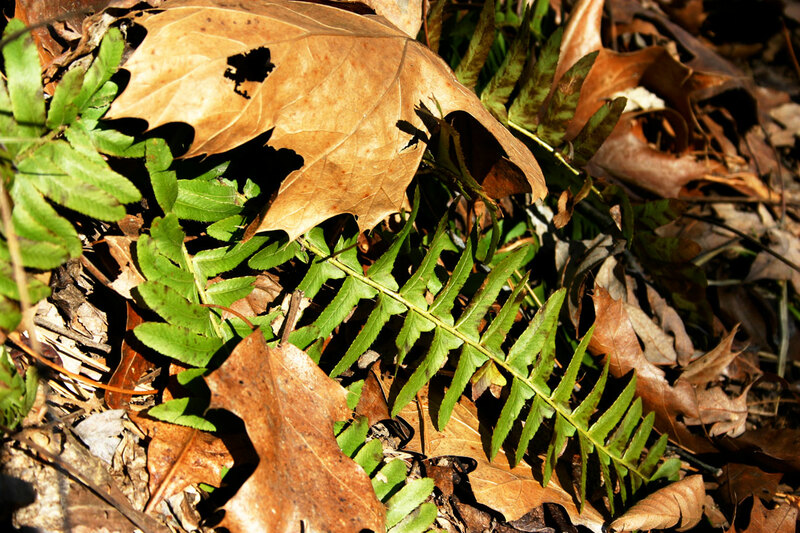 Forest Floor on the hills above Greer Spring (February 19, 2009). I rested upon the great sun warmed rock – where all about lay the glistening snows. And I saw the redbird actors gaily performing – before the huge, green cedar-tree backdrop – in the silence of the wintertime theater along Table Rock’s quiet shore. A lonely sentinel – grand, old and battered by countless years of Ozark weather – still standing massive and so tall – proud, close by the small rivulet of its long ago tiny, green-seed birth – waiting for the first blow of the ax and the saws of those who had now come to bring it down. Farewell, my dear old forest friend, farewell. PLATE 4. 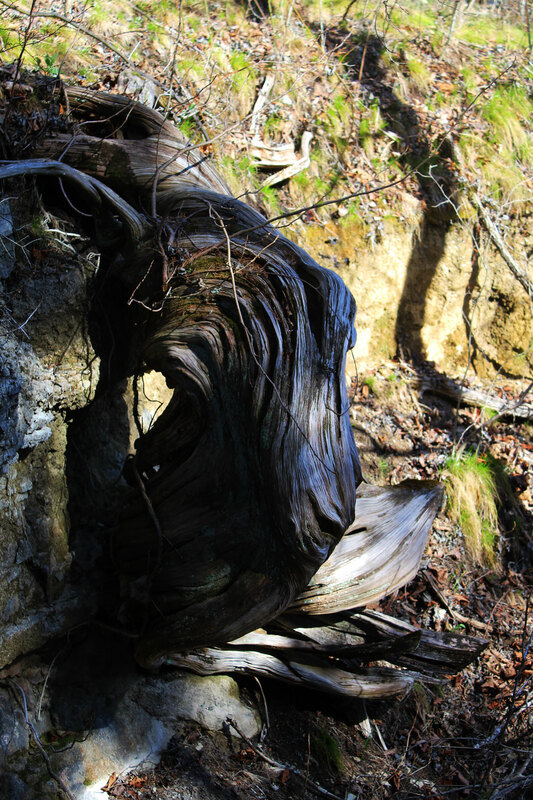 Gnarled Cedar near Mincy, Missouri (March 22, 2018). I leaned my breast against the giant old oak tree, my fingers twisted deep into its heavy bark – my ear pressed close against it, listening, deeply listening. As the wind twisted its limbs and distorted its giant trunk – I fancied that I heard tales of all that had passed this way in this old tree-man’s countless years – and it was grand, amazing – with storied scope and myriad colors almost beyond imagining. PLATE 5. Sweetgum leaves, rural Christian County, Missouri (October 21, 2012). I looked at the summer world through the windshield of my old truck. There stood the new, glaringly naked bluffs along 13 Highway. Great high slopes of barren orange clay and broken flint rock. There where used to live thick green stands of native oaks, old cedar trees, tall plumed grasses and a myriad array of wonderful, tall, ornamental trees donated by the Herschends and arduously planted by the young men of Lives Under Construction, years and years ago. PLATE 6. 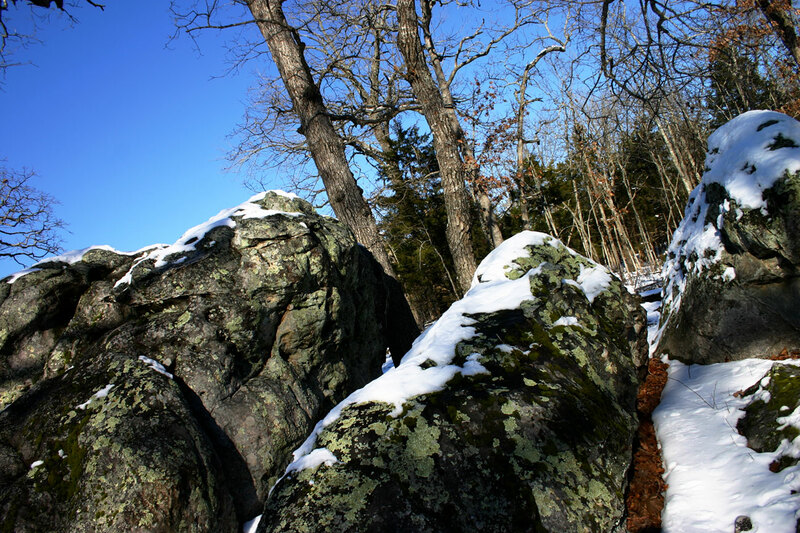 Elephant Rock with snow near Mincy, Missouri (February 10, 2010). I remembered how, each spring, I looked through this same windshield to marvel at the joy of seeing countless Ozark redbuds – and the earliest hark of spring, the flowering dogwoods. 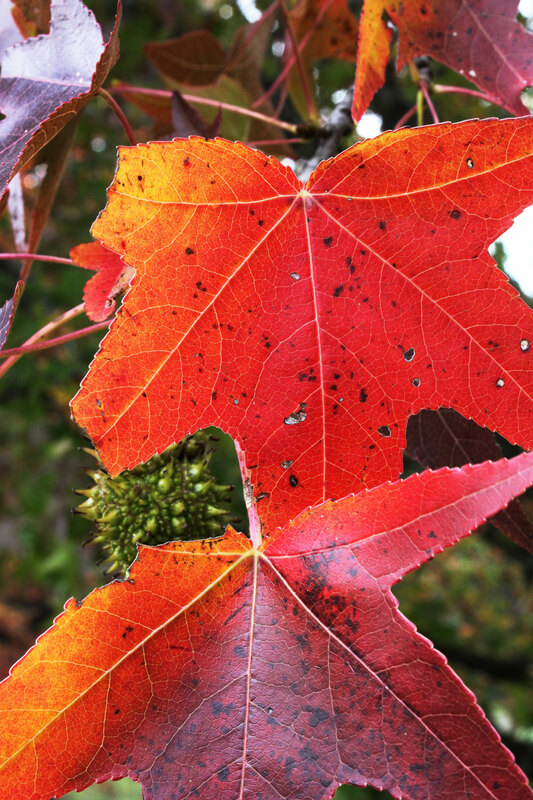 Then, come the fall, there would be oh so many hard maples and other ornamentals turning flaming red and gold, scattered across the backdrop of evergreen cedar trees. PLATE 7. Sun sets over Blue Springs, Shannon County (February 20, 2009). Such heart gladdening pictures of natural beauty to warm one’s very soul. Yes, I suppose there had to be this progress, but oh my, what a serious sacrifice of twice annual natural beauty we have now made – for this pedestrian gain. Now – will we all forget the Lives Under Construction-inspired beauty? Story by Jim Barnett. Photos by Joshua Heston.